Two very verbal, slow-cooked episodes open Season 2 of AMC’s Better Call Saul. Depending on your tolerance for extended dialogues, they’re either deliciously chewy or perhaps in need of a little pick-me-up. I’ll side with the leisurely pace en route to Bob Odenkirk’s scam-prone Jimmy McGill eventually becoming one of TV’s ultimate shysters, Saul Goodman, in the late, great Breaking Bad. 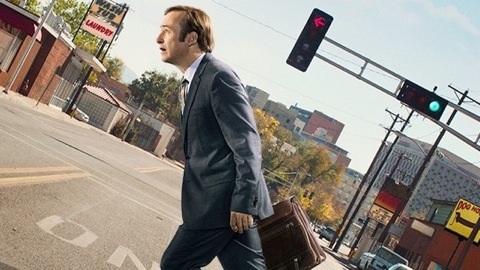 As origin stories go, Better Call Saul is still too savory to hurry along. As with Season 1, viewers will first see the present-day Saul in hiding as the hands-on mustachioed manager of a mall-encased Cinnabon store. Lasting for a little over five-and-a-half minutes, this entire interlude is filmed in evocative black-and-white. Let’s just say that Saul gets himself in a predicament before eventually leaving a lasting mark. Then it’s on to the Better Call Saul theme song, which again will be accompanied by different visuals for each episode. The first two hours, again set in 2002, train their sights on Jimmy and the two other principal characters in Better Call Saul’s triangle. Former cop Mike Ehrmantraut (Jonathan Banks) continues to work as a parking garage toll taker while slowly beefing up his side businesses. Lawyer Kim Wexler (Rhea Seehorn), still employed by the upper crust Hamlin, Hamlin & McGill firm, remains intent on salvaging Jimmy while he yearns to make their occasionally intimate relationship a keeper. Also included in a major way is Mark Proksch as an apprentice, milquetoast of a drug dealer who first appeared last season in the “Pimento” episode. Better Call Saul’s opening hours are significantly tied to his new dilemma. And Jimmy’s efforts to make it go away take quite a unique turn in Episode 2. These episodes aren’t shot out of a cannon the way Season 1’s were. There’s little sense of menace and ample time spent floating in a pool -- literally. But the opening hour’s eventual scam proves to be a nice payoff after a considerable buildup. And an extended, textured scene at the outset of Episode 2 looks deeper into the fortress of solitude that still grips but no longer paralyzes Jimmy’s mostly shut-in older brother, Chuck (Michael McKeon). An exchange later in Episode 2 pretty much sums up where we’re eventually going here. “Where and when?” Jimmy replies. I’m still roped in by a series whose little moments can also be mini-monuments on various roads to perdition. Creator and executive producer Vince Gilligan isn’t afraid to let it all air out at a measured pace. But Better Call Saul is still avoiding the pitfalls of simply running in place. Instead, great expectations remain intact for a Season 2 that so far continues to make its mark by delivering just a little at a time.